Performances of data structures, especially collections is a recurrent subject when coding. If you have never heard about such a topic, here is the chance, otherwise it's the hundredth time you see such title, and you are probably thinking "Another article about this topic, I'll probably not learn anything new, but anyway I'm bored so I'm gonna read it ...". And you are probably 90% right, nothing really new here, but I promise you a couple of colorful and beautiful charts that we don't have the opportunity to see everyday (and the ability to create your own) . The first time I started wondering about collection performances was when I started working with some > 100 000 elements collections. At that time, I heard some bad jokes such as "I just understood why the Java logo is a cup of coffee, because Java collections are so slow that when manipulating them, you have the time to go and grab some coffee before they do the job ... Just kidding' !". At that time, I wanting to use am implementation of a java.util.List that would have good performances on all the common methods provided by the interface (let's say get(index), add(Object), remove(Object), remove(index), contains(Object), iterator(), add other methods that you like), without wondering about memory usage (I mean, even this List would take 4 times the size of a LinkedList it wouldn't be a big deal). In other words, some List that would not be instantiated a million times in my application, but a couple of times, and each instance will have great performances. For example, the model of a GUI Table, or some other GUI component, which data will evolve frequently, usually in batch of operation (the user add 100 000 elements, remove 50 000, etc.) , and which performances will sometimes be critical. First of all, what do I mean by good performances ? Usually good performances are equivalent to an average complexity of O(1). But this one is impossible to get all the time, so at first let's study current JDK List/Collection implementations and see what we have. Well, we already know so basic information about Collection methods complexity, such as the fact that a HashSet has an average O(1) complexity for its contains(o) method, or that ArrayList is also in O(1) for its method get(int index), etc. For more details, check this post of Lalit Pant which did a nice summary on this subject. and the warmUp() method will manipulate a little the collection, to be sure that the internal structure is allocated. A timer is used to timeout too long method benchmark, indeed my purpose is not to have a complete benchmark, but just a global idea of what implementations of Collection are efficient for a given method. 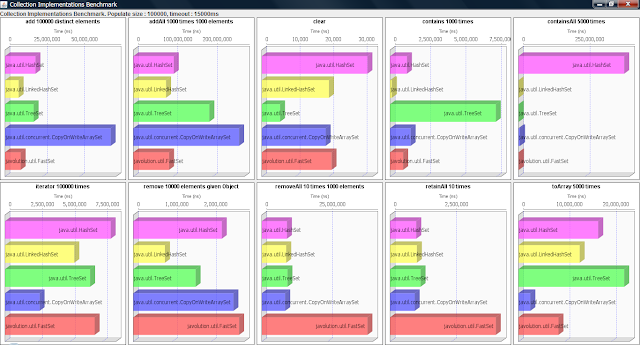 I will finally display the results in a JFreeChart component, because the console output is not very friendly to compare results. The complete source of the Benchmark class can be found here, feel free to play with it ! (To those who will think "You should have used a proper tool to do this stuff", I would answer "Yes, you're totally right, but the fact is that when I started it, I didn't mean it to be so big in the end. Anyway, I like the press-button execution ..."). We can see some interesting things here, we confirm what we already knew about some collections, the CopyOnWriteArray is significantly slow on data modification, etc, we also can see, between ArrayList and LinkedList some significant differences (OK, the benchmark does not cover all the different cases, and maybe we are in the particular case were ArrayList is better than LinkedList, anyway it gives us an interesting overall). So, after tuning a little bit the benchmark, studying my charts, I thought "How about creating my humble but own implementation of List ?" with a simple idea, not by implementing some cute-edge algorithm, but just by combining existing implementations. (If you're not very enthusiastic about this idea, you can go directly to the Memory usage of Collections section below). By this I mean a CombinedList which will use internally a HashSet, an ArrayList and a TreeList, and in each of its method, will use the data structure the most efficient to do the job, and so my CombinedList will be almost as fast as the fastest collection for all of its methods. By almost I mean their will be a little delay involved by the fact that we will sometimes need to synchronize the data in the internal collections. But it's not a big deal, because the clear() and addAll(collection) methods are quite fast, as we saw in our first charts, and they are definitely faster than some other O(n) or O(n x n) operations on some collections. So it's faster to recreate from scratch the all collection than applying a remove(Object) on an ArrayList (once again, here I don't care about Memory and GC). We'll extend <strong>java.util.AbstractList</strong>, and don't forget to increment modCount when changing internal data, so that the ConcurrentModificationException mechanism is inherited from it. 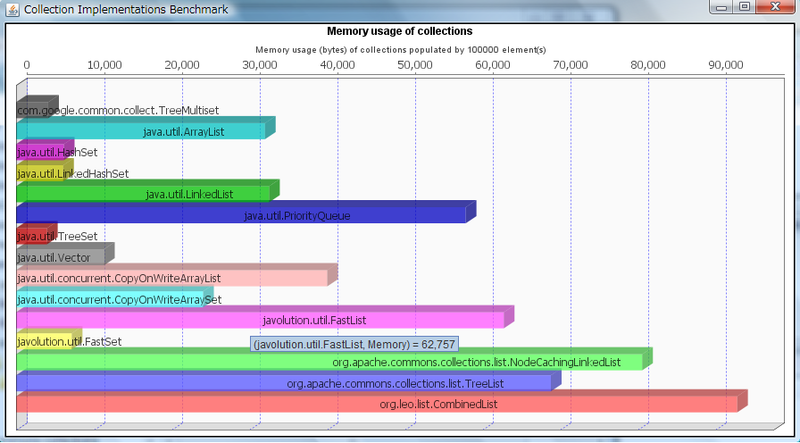 Finally, we'll do some custom optimization, on the retainAll(Collection) as mentioned on this Java bug. And we are done, the complete source of the CombinedList class can be found here. We are quite good on contains(Object) and containsAll(Collection) thanks to the HashSet, and we should statistically be a better than ArrayList on remove(Object) and removeAll(Collection) thanks to LinkedList. We could eventually replace the LinkedList by a TreeList to be better on the remove (TreeList is in O(log n) for the remove). We could also parametrized the use of an internal collection with the size of the data, or the index of the data regarding the size of the list etc. Ok, I said that I didn't care about memory, but let's take a look at what is the size of this CombinedList, and at the same time the size of other collections. Ok, we have what we were expecting, that is to say our CombinedList size a LinkedList + an ArrayList + a HashSet. Also, this means that this List will generate a lot of GC, and thus make it not suitable for massive random operations. But for my first purpose of a model for my JTable, it's a pretty good deal ! And what about JIT compilation, Heap allocation impact on the benchmarck ? Just a final remark concerning the benchmark. 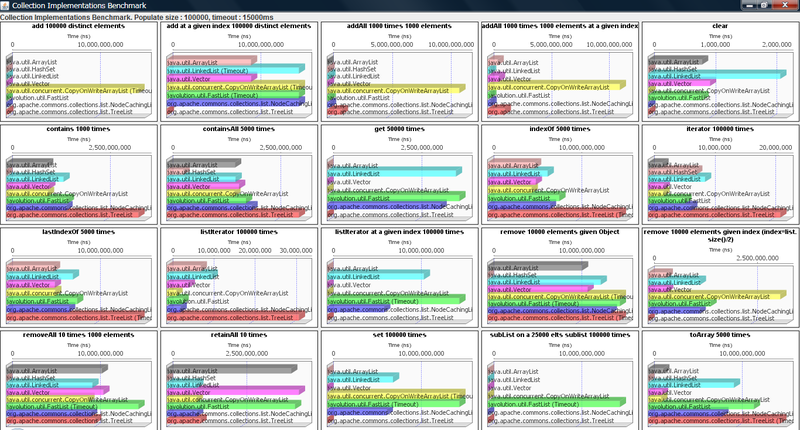 Does the fact that all the benchmarks are done in the some JVM impact the results ? The answer (correct me if I'm wrong) is that, if I executed just one time each method, and if the methods were very fast, the JIT compilation time could have an impact on the performances measured on the first Collections tested. 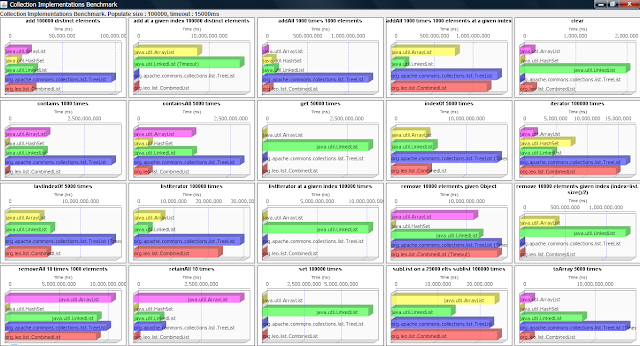 That's the reason why in my benchmark, I first test the CombinedList, to be sure to have the worst case performances. But the fact is that we execute several (thousand of ) times the same method, so I consider the JIT compilation time is negligible. Also, what about Heap allocation and status and its impact on the test ? For this purpose, I carefully free all objects at the end of each collection benchmark, and call a heavyGc() to be sure to minimize this matter. Thanks for the post, I am techno savvy. I believe you hit the nail right on the head. I am highly impressed with your blog. It is very nicely explained. Your article adds best knowledge to our Java Online Training from India. or learn thru Java EE Online Training Students.